If you have not started watching Mahabharata airing on Star Plus at 8.30 PM (Monday-Friday), then my friends, it is time to start! Most of us grew up watching B.R. Chopra’s and perhaps we have watched it multiple times (Here’s a link to Mahabharata Movies and Books for your reference). How can we forget the larger than life actors as the characters of Mahabharat: Mukesh Khanna as Bheesma, Nitish Bhardwaj as Krishana, Gufi Pental as Shakuni, Punnet Issar as Duryoghan and Rupa Ganguly as Draupadi. If you are one of those who still relish old Mahabharat and love the story, it is now time for you to watch slicker Mahabharat. We will give you 5 reasons why! Old is gold- no doubt about that! The audience discerns between a plain old remake, and a well thought out screenplay (remember how Ekta Kapoor’s remake of the poorly packaged, twisted, and narrated Mahabharat was royally rejected by the audience?). Makers of new Mahabharat have not veered too much from the old look and feel of the original characters, keeping the nostalgia and old-world wonder alive! The uncanny resemblance of the actor that plays the role of Bhishma with Mukesh Khanna makes us feel this casting strategy has worked! There’s a comfort factor seeing similar looking characters we have learnt to love over the years. It’s the same old story you’re thinking right? Not so much. The new version has managed to include many untold but important stories that were missing in the older version. For example, who knew that Bhishma (the protector of Hastinapur kingdom) actually compelled the King of Gandhar to marry off his daughter, Gandhari to blind prince of Hastinapur – Dhritarashtra, thus explaining Sakhuni’s (prince of Gandhar and Gandhari’s broher) dislike for the arrogant Hastinapur empire. Who knew that Madri was not a docile and obedient second wife of Pandu, as shown in the original BR Chopra series? The new version sketches her character a bit more realistically. She is a stunning, ambitious and young princess, who didn’t really appreciate Pandhu’s first wife – Kunti. Who knew that it was Satyavati’s greed and ambition (not her father’s as shown in BR Chopra Mahabharata) that drove Bhishma to take that famous “oath” of chastity and servitude to the throne of Hastinapur? Satyavati is shown blindly pushing her own inadequate sons’ candidacy as the future kings of Hastinapur, inflicting gross injustice upon her step-son Bhishma. The new Mahabharata indicates Gandhari potentially using surrogate mothers, or fancy technology to conceive 100 Kaurava sons with the help of the great Sage Ved Vysa. Besides developing these critical, untold stories in greater detail, the makers have also added dramatic twists to the story. For example, there is a brief eye-to-eye contact between Kunti – the young windowed daughter-in-law of Hastinapur, and young Karna – Kunti’s child out of wedlock, as Karna is driven out of Hastinapur by Bhisma. Though Karna was raised by a royal charioteer in Hastinapur, the new Mahabharata shows that Karna and Kunti were never in the city at the same time as he was growing up. In fact it shows Kunti making attempts to disclose her secrets about Karna, somehow, certain chain of circumstances prevent her from doing so. The first time Kunti attempts to come clean out Karna, her husband Pandu is forced to leave for war and returns with a new bride – Madri. Having a competitor under the same roof sharing her husband, Kunti decided not to reveal her secrets. The second time Kunti attempts to do so, Pandu cuts the conversation short to discuss his own desire to have mighty and brave sons from her. The story of Mahabharata is not about painting a perfect picture of imperfect humans, rather it tells a story of a powerful empire with untamed ambitions and lessons learnt from the epic battle that ensued! Even the holiest of character such as Dharamraj Yudhisthira (who bet his wife in a game of dice), made blunders that are questioned by the common man of the modern age. New Mahabharat does not paint a holier-than-thou picture of characters, and elaborates the motivations influencing each character. Dhritarashtra is shown blindly favoring his son from the beginning and not showering any sort of paternal love towards his dead brother’s sons (he always saw Pandavas as hurdles in way of his son, Duryodhana’s ambition). Bhishma is shown as an emotionally detached caretaker of the throne. Rarely does he cry, rarely does he emote. The whole – Arjun-Bhishma grandpa-grandson playful moment that BR Chopra showed is missing in this version. Bhishma supported Pandavas, because he saw them as the only hope for Hastinapur’s future. 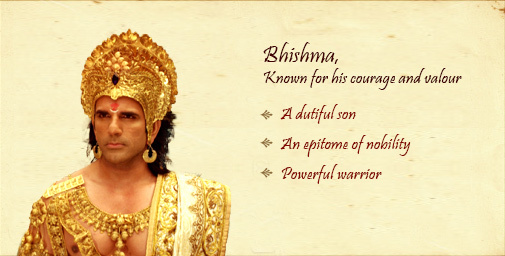 We do not see Pandavas getting any paternal playful moment from Bhishma as well. 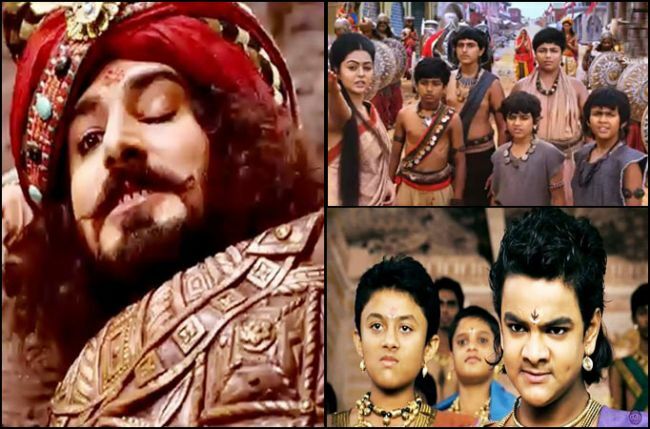 Absence of a father figure in young Pandavas life is clearly shown in the episodes. This could be the reason why Pandavas learnt how to love and protect each other as they grew up. Perhaps that explains their unbreakable unity and their devotion towards their mother who raised them as a single mother. Satyavati is shown as an extremely ambitious woman. In old Mahabharata, she realizes her the damage her ambitions have done right after the death of her alcoholic sons. Newer Mahabharata shows her being pushed out of court by the her ambitious and ill-mannered grandson, Dhritrashtra, who sees no value in keeping the meddling old lady around. In the new version, Ghandari is shown as a feeble wife whose only goal in life is to please her husband. While she does not hesitate to confront her husband when he is wrong, however, the serial shows Dhritarashtra largely ignoring her. He has no respect and love for her. That perhaps explains why her husband and sons never really listened to her. 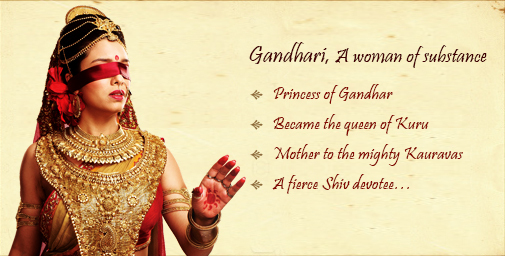 While Kunti has a strong emotional bond with her sons, we hardly see Gandhari interacting with her sons. A scene particularly emphasizes this, when young Bheema is punished by grandfather Bhishma. When Pandavas come to Kunti to inform her about the punishment in the middle of her puja, without even listening or looking at them, she says, “whatever it is, share among five brothers.” Without even questioning, five brothers decide to share Bheema’s punishment happily. On the other hand, Duryodhan is shown as an extremely pampered son. Dhitrarashtra is shown feeding his blind ambitions to be the ultimate ruler of Hastinapur into his son as well. There is a scene when Dhritarashtra questions why Duryodhan wants to harm Pandavas. Duryodhan replies, “Father, you only taught me that they are our enemies, and it is my duty to harm enemies.” The serial shows that it was Dhitarashtra’s blind ambition and his selfish motives that gave birth to the character Duryodhan. There are multiple such scenes that define the logic behind the development of each character. Lord Krishna – the master story teller and a teacher himself tells the story of Mahabharata to the audience. He appears in every episode as a narrator and explains the chain of events happening in each episode. Though Mahabharat though touted as an epic story of ancient India, finds relevance in modern times more than ever. The makers know that they are telling the same story to today’s audience, and thus, they have tried to highlight every aspect of the story that is relevant in today’s time. There is a arrogant but foolish Duryodhan, a righteous Karna in bad company, or a manipulative Sakhuni among us. How often do we encounter those colleagues who are always plotting and scheming for promotions, or those politicians in our country who can do anything to stay in power, or brothers fighting for a property. These are all the characters of Mahabharata, and thus this explains why Mahabharata story is relevant to our day-to-day life as well. Krishma reminds us of these characters that we have within ourselves, asks us to analyze our own actions and rectify it by learning from the Mahabharata stories. Much needed lessons in Kalyug! The new Mahabharata is apparently the most expensive TV show in the history of Indian television. And the grand and lavish sets, costumes, jewelry and locales of Mahabharata explain why it is the most expensive production. The production house has invested heavily to ensure that the show presents a magnificent narrative. After all, it is a story of the rise and fall of the most powerful and empire of ancient India. 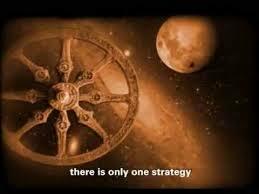 Truly, it is a visual treat to watch the episodes of Mahabharata. So folks, we can go on and on why you should watch new Mahabharata but we want to engage with you about reasons why you think we all should watch this monumental show! Perhaps in the future we will start discussing about Mahabharata characters or situations. As for you- do start watching it. Pandavas and Kauravas are still young and the foundation for the epic is being laid. There will be more drama, more twists and more lessons to learn from this story. Do watch the show and enjoy! This sirial is so inspiring and knowledge full , its music so Peace full please start again ……….. Yes, Bharadwaj was exceptional in his role. I imagine Krishna in that “roop” or avatar always. What a crap! Krishna was black not fair, correct that first. Even the name “KRISHNA” implies dark! Ouch! The new mahabharat is more detailed in terms of stories compared to the older obe….secondly, all characters have been highlighted in a very convincing manner e.g..the upapandavas, abhimanyu, kunti, gandhari, shakuni…..and who can forget krishna? 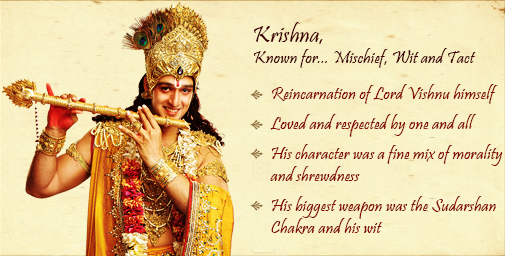 Krishna is perhaps the best part of the whole series…..he plays his part with utmost perfection….but of course, you cannot compare the nitish bhardwaj with the new mahabharat’s krishna…..and there a few things that are missing in the new mahabharat that were present in the older one e.g. bakasur vadh by bhima, and how sanjay gets his divine vision, and how ganga gives birth to shantanu’s sons etc…all in all, it was a wonderful experience watching the whole.of the new series…..all characters were given significance unlike the older version….. Awesome! Really true… i m a young girl n thats y had not seen that old mahabharat completely but i just loved the new one to the core. I wish i wud have read this earlier as i started watching it a little late. But nevertheless teachings are endless in MB… i learnt a lot from it n really The Gita gives me an answer in every problem. Though it ended on the point asking for more…. i still cherish it!!! many things can be learn from the new mahabharata ,and it is also for the today’s children who are not like to watch the old mahabharata ( like me ). new mahabharat is very good in every aspect……it relate to our day to day life….it shows emotional aspect of every character……..
amazing series !! worth watching !! made specially for new generations !! Love these images. I saw a stage version of Mahabharata and it was epic. Great story and one I could watch again. Many thanks! It’s a great show…dramatic but great. Next Next post: Gay in India – You’re Illegal!